Ann has created a new pattern for this months contribution to Hobbyjournaal 113. I decided to make two cards this month, one for Christmas and another for a birthday. The sheet is number 8 and also comes with a fabulous pattern. 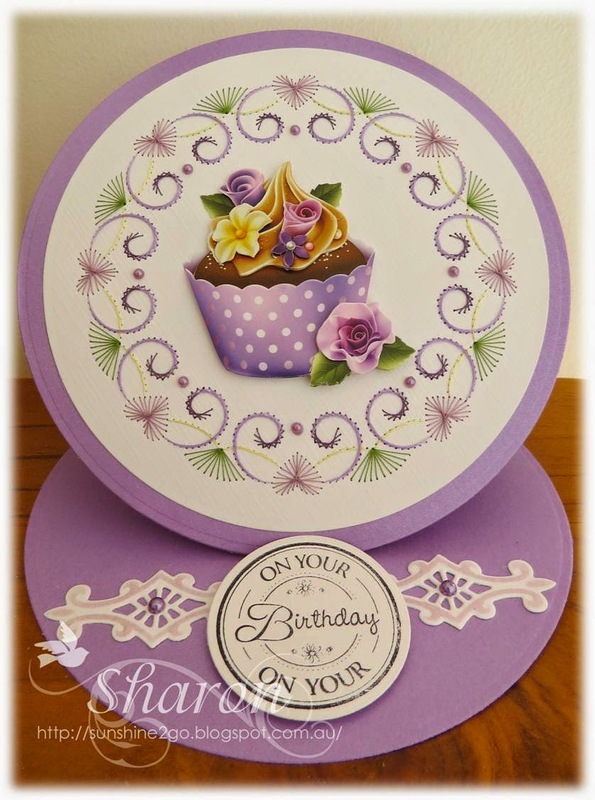 I used two dies for the birthday card and they are Nellie Snellen mfd071. 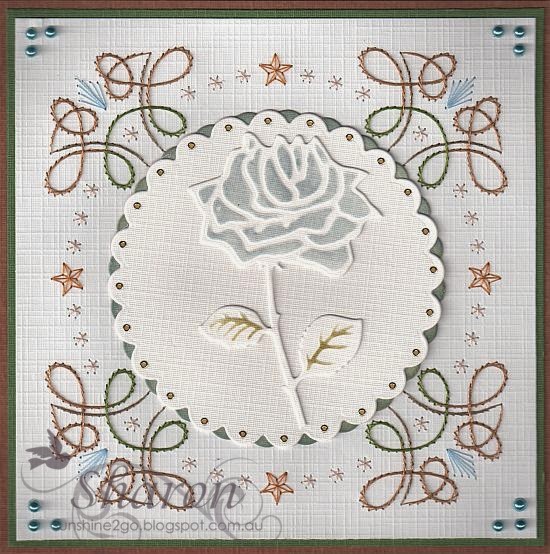 The rose is by Marianne Design LRO294. Come to Ann's Paper Art webshop and have a look at all the new exciting things. I am pleased that I have now started on my Christmas cards as December will be here before we know it. This month is Sylvia's birthday and this is the card that I created for her special day. available from Ann's Paper Art webshop. Threads are Mettler Polysheen 0520, 2764, 2832, 3030, 5833. I adore the little cupcake on the Embroidery sheet. Happy Birthday is from Lili of the Valley. Distressed ink and pearls have been added. I loved creating this birthday card and I hope that you like it also. This week is Sonni's birthday and this is the card that I created especially for her. Threads are Mettler Polysheen 0630,3842, 3951,3951.
it also has a gorgeous die in the centre. 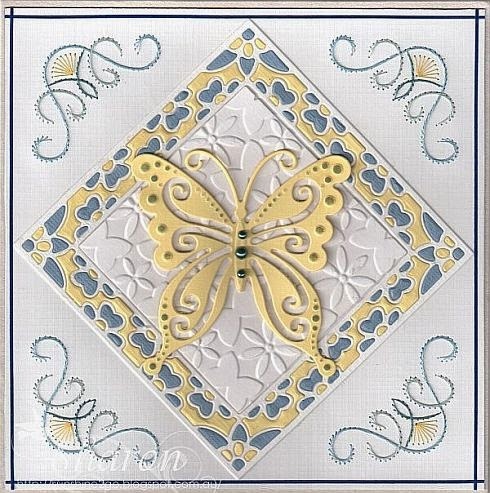 The butterfly is Marianne Craftables CR1205 it is one of the first dies I bought, that was a good excuse to buy my Big Shot. 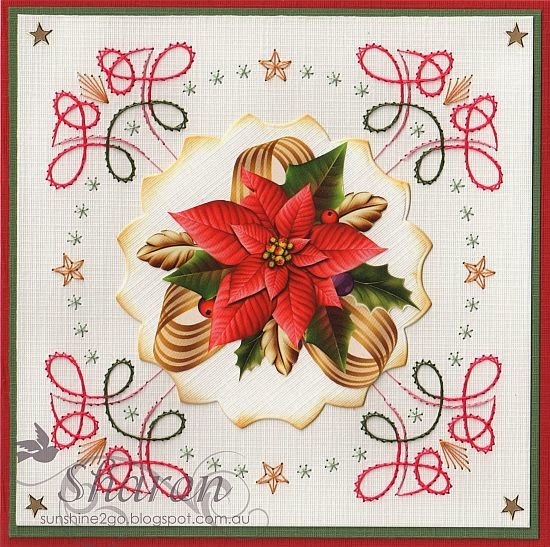 I have used a Spellbinder reversible embossing folder EL-005 in the centre. I enjoyed creating this birthday card and I hope that you like it as well. It is lovely to make something a little different. This month my exchange card was made for Sue. I decided to make Sue a personalized card and I know that blue is her favourite colour. The pattern is a607 & a2066 they are both available from Ann's Paper Art webshop. Threads are Mettler Polysheen 3840, 3853, 3871, 3951. The die is Go Kreat - Frilly#10. Light blue card is from Lili of the Valley "Bear Necessities" I distressed the edges. to finish the card off. I enjoyed creating this special card for Sue and I hope that you like it also. I was asked to create a wedding card for a friend, here is the end result. 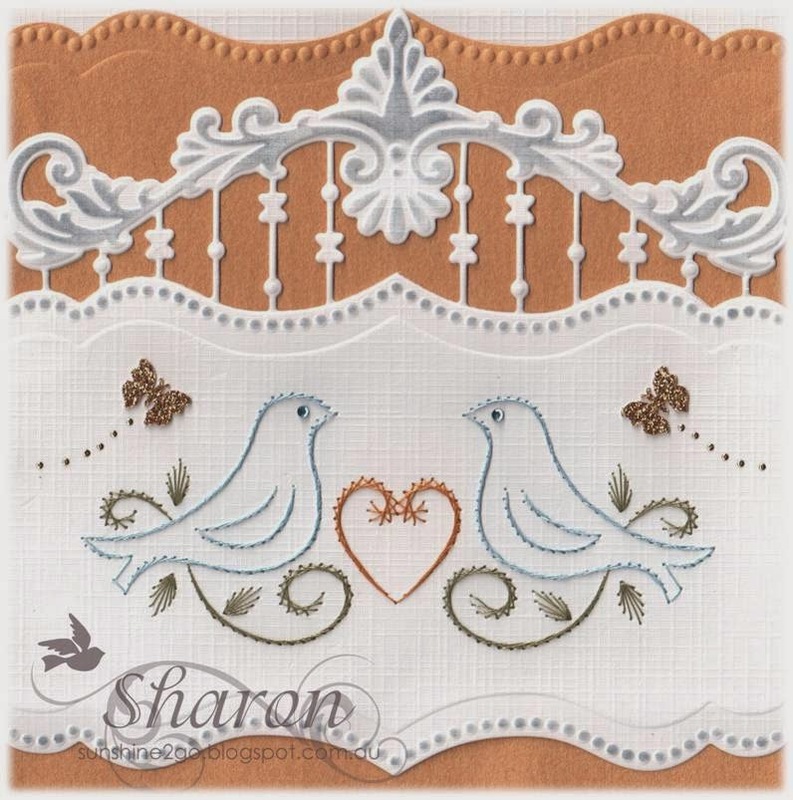 The pattern is a275 and is available from Ann's Paper Art webshop. I love this pattern it can be used for many special occasions. Threads are Metter Polysheen 0824,3951 6133. 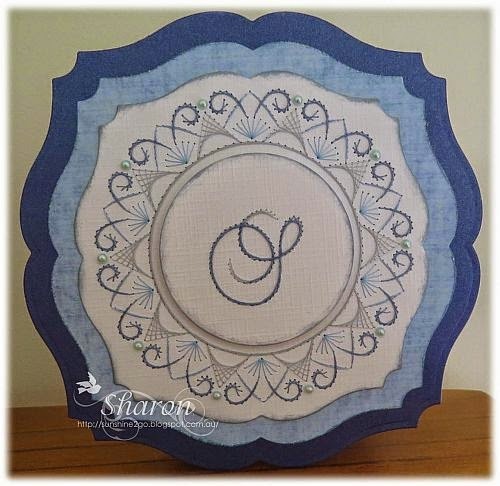 The gorgeous die is by Marianne Design LR0300 and really compliments the pattern. Tim Holtz distress ink "weathered wood" butterflies and gems have been added. I hope that you like this special card.